If you thought figuring out what it is that you really want to do after Class 12 was the real challenge, wait until you have to pick a college. For those of you who have taken their Class 12 boards this year, the deliberations may have already begun but the enormity of this decision-making process will dawn upon you only once you have your result in hand. Depending on how well or poorly you have performed; your options may multiply or shrink immensely. Colleges that you thought were way out of your league may suddenly be an option or you may miss the cut-off for the dream college you were counting on. Of course, every student wants to be a part of the best institutes and colleges to better their prospects of quality education. While the reputation and legacy of a college is an important factor governing your selection, it should not be the sole parameter to base your choice on. For instance, just because St Stephen’s College, Delhi, boasts of an enviable reputation, does not mean your single-minded focus should be to secure a seat there. May be another university has a better course or curriculum that would serve your career goals better. Keep your mind and options open. Assuming that you already know which course you want to pursue, your next step should be to make a list of top colleges that you’d be eligible for and compare their course structure, curriculum, faculty and overall infrastructure to zero-in on the most favorable option. You are going to spend three precious years studying your chosen course, so understanding what it comprises and how well the faculty at particular college is equipped to impart quality education is essential to avoid being disappointed in your choice when it is too late. NIRF or National Institutional Ranking Framework (NIRF) is a method of ranking higher education institutes in India introduced by the Ministry of Human Resource Development (MHRD). 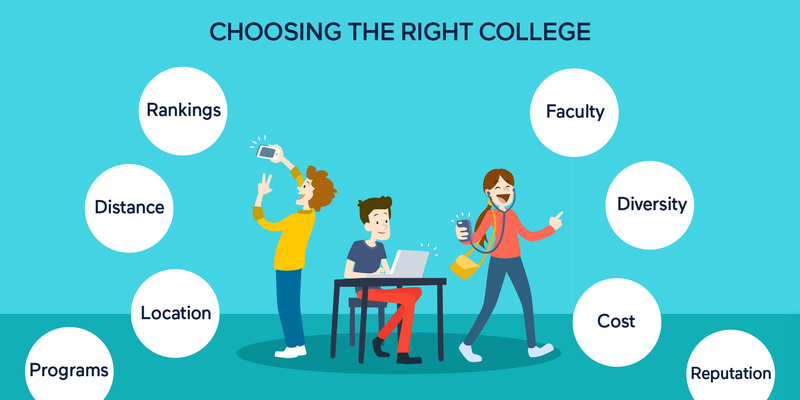 Analysing the NIRF rankings for different colleges on your list can be a great way to assess the quality of infrastructure, education, and faculty support they offer. Unlike school, your college education isn’t going to be all about classroom learning. After all, it is here that you’ll spend the formative years of your adult life and the experiences you gain on the college campus will help you prepare for the dynamics of the real world that awaits you. A college that focuses on extra-curricular activities such as theatre, public speaking, art, adventure camps and so on, will help you hone your skills and pick up practical knowledge that will widen your perspective and play an integral role in shaping up your personality. Landing yourself a seat in the ‘most prestigious’ college may prove counter-productive if the future prospects offered by the institution do not resonate with your career goals. For that, of course, you need to be clear about your own goals and then examine which colleges are in line with them. For instance, if you want to land a job straight out of college, it is imperative to pick one that has a good campus placement program in place. If such information is not available in the college brochure/website/information cell, reaching out to the alumni can help you get a realistic view of the ethos an institute fosters. Just a month ago, a 24-year-old junior resident at the prestigious PGIMER in Chandigarh committed suicide because he was not able to adjust to the new culture and language barriers, and slumped into depression on account of not being able to return home. At the outset, a far away location may seem manageable but a drastic change in environment can get too overbearing at times. So, it is definitely an aspect to factor in while making a choice. Similarly, overall cost of your education can prove to be an overriding factor. Make sure you don’t choose a college that places undue financial strain on your family or puts you under the pressure of a towering education loan. In most cases, what your college has to offer may not be worth it.